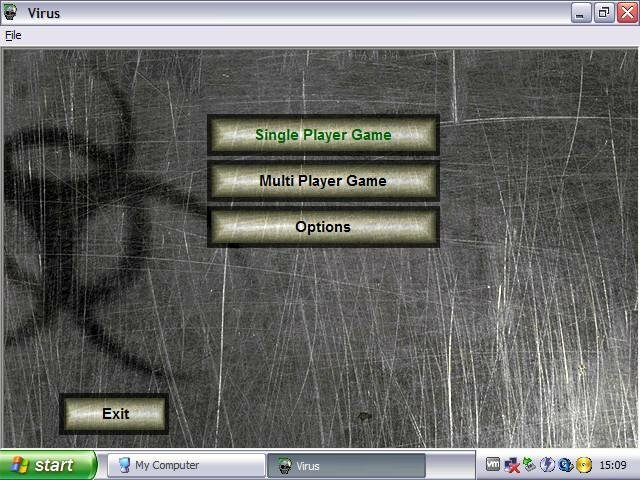 Virus is part Descent clone and part strategy game where you fight against computer viruses in a 3D environment. The Descent part is pretty simple – you can fly around in your ‘computer’ in a 360 degree freedom of movement. For the strategy element, you build a base, units, and harvesters. 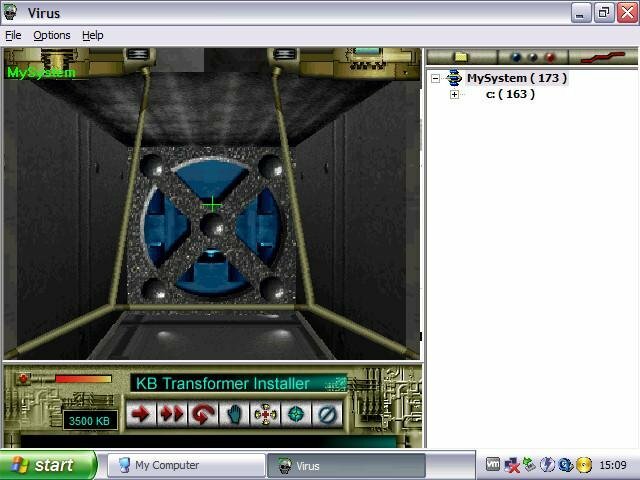 For example, the main base is a KB Transformer, which takes KBs (units of energy stored in files – read ‘tiberium’) and converts them into units of energy you can use to repair or build vehicles or create new structures. 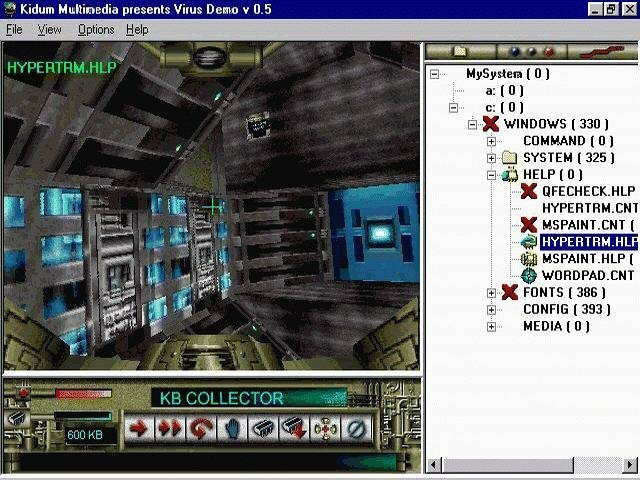 To collect KBs, you send out your KB collector to files in your system’s directory. Meanwhile, you need to protect your base from the virus that is constantly eating away at your system. As clever as the idea is, Virus is plagued with serious flaws. First and foremost is the artificial intelligence. You can send out your vehicles in two ways — either control it yourself from a first-person view, or click on its destination via the auto-pilot. If you opt for the computer to do the work, you’re in trouble because the AI isn’t all that smart. 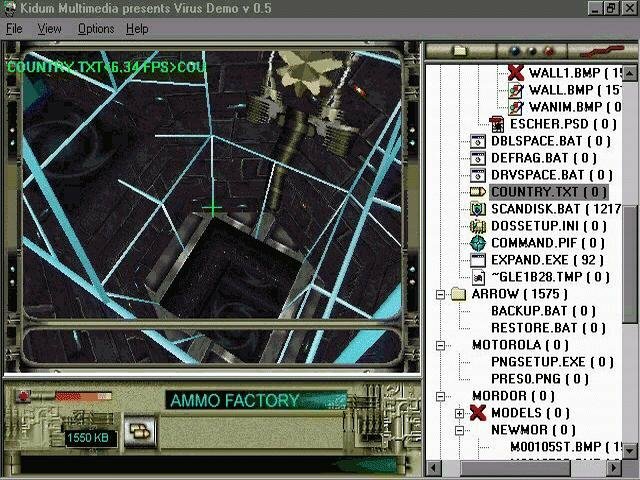 When you send out a unit to a destination and don’t monitor it constantly, an enemy virus will come along and blast it to bits. These AI-controlled units won’t even try to avoid enemy fire or run away. 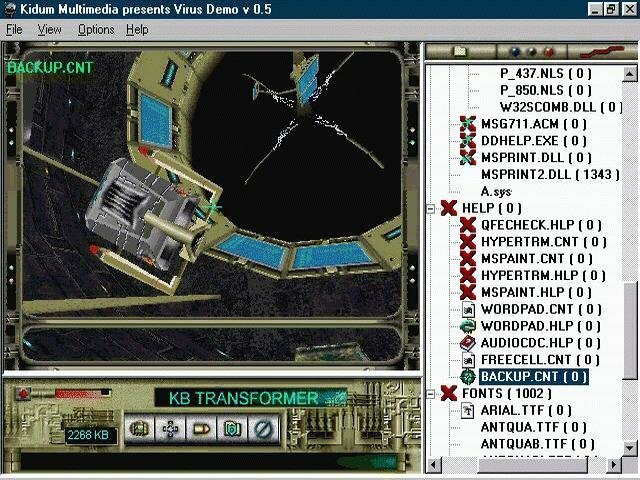 It’s way easier to pilot the vehicle yourself and destroy the virus. Which leads to another fault — the first-person mode. 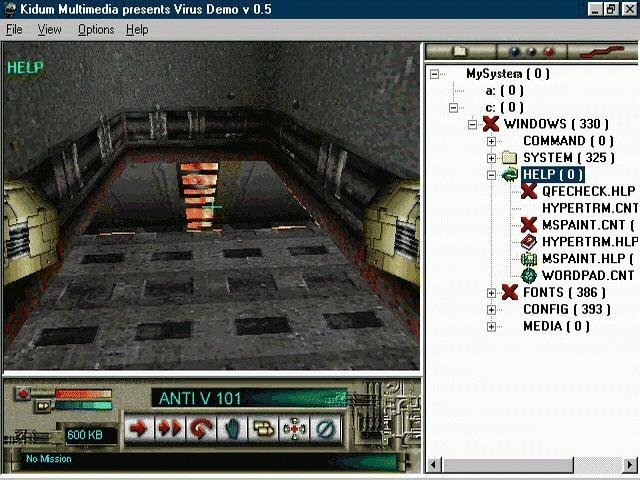 As you move through the pathways and directories of your computer’s file system, the gameplay is similar to that in Descent, but not nearly as fluid. Until you master the controls, you’ll constantly bump into walls and have difficulty getting through doorways. Gameplay in first-person mode is choppy as the computer reads files from the hard drive, and you might suddenly find yourself a screen away from where you thought you’d be. 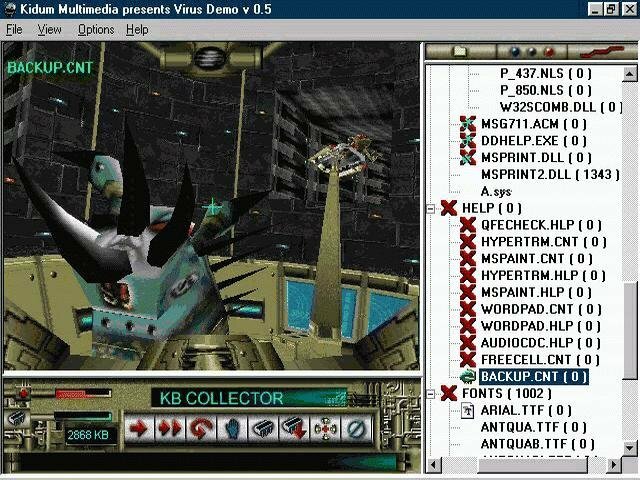 While destroying individual enemy virus units isn’t that difficult, flying through the computer maze can make your head spin. All the doors are color-coded, to indicate whether you’re heading deeper into a directory, out of it, or along to files in the same directory. Overall, Virus is a real disappointment. It seems like a great idea, but in practice, the fussy controls of the first-person mode and the constant attention required by the strategy element make it too frustrating and fiddly to be any fun. Luckily, getting rid of this virus is as simple as deleting it off your hard drive.